I’m all for having a good time. But there are some things that give your homeowners insurance company heartburn. It’s not that the people at your insurance company don’t like having fun. They’re human too. They worry about your guests. Or the neighborhood kids. But if you’re getting a pool, plan on installing a fence around it in with a locked gate. And make sure the pool is properly insured if a storm rolls through. That’s a large purchase. The same is true if you buy a trampoline. Plan on having netting around the sides and make sure it’s anchored down. It would be wise to consider increasing the liability limits on your homeowners policy or adding a Liability Umbrella policy to give you an additional layer of coverage. Either way, both are inexpensive to do. Most homeowners policies in Missouri start with a limit of liability at $100,000. Where a Liability Umbrella coverage limit starts at $1,000,000. 2/3 of ER injuries are children ages 6 to 14. 15% Children under 6 were treated in the ER. 40% of injuries are to the leg and foot. And I hope don’t get caught in the rain(s) of life need to use your Liability Umbrella. Next week one of the neighbors kids are injured playing in your pool. Now the parents of the child are suing you. The lawsuit exhausts your Personal Liability limits on your homeowners policy. It’s a good thing your bought a Liability Umbrella. Imagine an umbrella hovering over your home and autos. A Liability Umbrella will do just that. If you use up your underlying liability limits on your home or auto insurance, a Liability Umbrella will kick in. If you think you may get a pool or trampoline, let us know. Remember we’re part of your team. First time here? 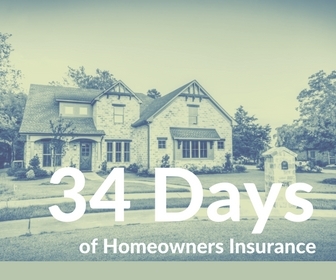 Here’s a full list of 34 Days of Homeowners Insurance.